groups responsible for the oversight of aircraft approval and new routes. of our business.” The long-range business jet, which can fly nonstop from London to Los Angeles, is still expected to enter service this year. Talks between Trump and congressional Democrats are still at stalemate despite some of his fellow Republicans advising him to cut a deal as tension mounts across the country. Also according to Reuters, analysts do not expect a major impact on large airlines’ capacity as a result of FAA certification delays, though management comments about the effect of a prolonged shutdown on travel and operations are awaited. Finnair has introduced a service, where its customers can offset the CO2 emissions of their flights by supporting a CO2 emission reduction project or reduce emissions by buying biofuel. Push for change service is available on Finnair web pages and customers can also use Finnair Plus frequent flyer points to pay for the service. Finnair offsets the CO2 emissions of its own personnel’s duty travel through the CO2 emission reduction project. Finnair customers can choose to support a CO2 emission reduction project, which enables the use of more efficient cookstoves in Mozambique. Efficient cookstoves reduce charcoal consumption and deforestation. The payments are transferred to the project in full through NEFCO, the Nordic Environment Finance Corporation. The offset charge is 1 euro for a return flight within Finland, 2 euros for a return flight within Europe, and 6 euros for a return intercontinental flight. The charges are based on the average emissions and the costs of reducing a CO2 ton within the project. Customers can also choose to support biofuel flights. The use of biofuel reduces CO2 emissions by 60-80 percent depending on the raw material. Finnair customers can buy biofuel for 10, 20 or 65 euros, to reduce the emissions of a return flight in Finland, return flight within Europe or return intercontinental flight. Airflow Solutions has received European Aviation Safety Agency (EASA) Part-145 approval. Under the certificate the company is now fully authorized to perform repairs on all items within their Operation Specifications. Airflow Solutions provides expert level services in a wide variety of metal and composite repairs. These include bonding, solid laminate repairs, metal-to-honeycomb repairs, metal-to-metal repairs, AOG support, and painting. Founded in 2015, Airflow Solutions is one of the world’s leading providers of asset management, composite aircraft structures, composite repair and support services & solutions. As of today, Airflow Solutions, has a 35,000 ft². MRO facility in Tulsa, Oklahoma. HAECO Xiamen, a member of the HAECO Group, has successfully completed cabin modification work on the first of Virgin Atlantic Airways’ four Airbus A330-200 aircraft. The cabin received a complete makeover with brand new business class suites unique to the A330-200, the addition of premium economy class, re-pitched economy class seats, newly fabricated carpets, an upgraded IFE system, and modified lavatories. The successful completion of this prototype marks another achievement in HAECO Xiamen’s partnership with Virgin Atlantic, following cabin modification programmes for the airline’s Boeing 747-400 and Airbus A330-300 fleets. Nearly 16.8 million passengers passed through the gates of Václav Havel Airport Prague in 2018, and a total of 155,530 take-offs and landings were performed. The positive trend has thus continued, with 9% more handled passengers and almost 5% more performed movements, a slightly slower growth rate than the former year. Willis Lease Finance Corporation has closed a sale and leaseback transaction on ten Airbus A319 aircraft with easyJet. The aircraft are powered by CFM56-5B engines. The deal combines elements from across the Willis Platform, including leasing, trading, and asset management businesses, to provide a tailored solution designed to support easyJet in the fleet management of its existing aircraft as it introduces the latest generation of Airbus A320neo family aircraft. FLYdocs, the aviation data and records management solution provider, has signed a 5-year contract with Swiss airlines, SWISS and Edelweiss Air, who will use the FLYdocs® platform for the ongoing management of their maintenance and engineering records across their entire respective fleets of 90 and 15 aircraft. The FLYdocs® platform provides a centralised cloud-based digital replica of all aircraft technical records – right back to birth. That means, once uploaded into FLYdocs®, the millions of paper records, combined with electronic documents often distributed in different formats around most aviation organisations, are now instantly available in useable, industry standard formats to support business critical operations, such as verifying airworthiness compliance, and aircraft sales and transitions. 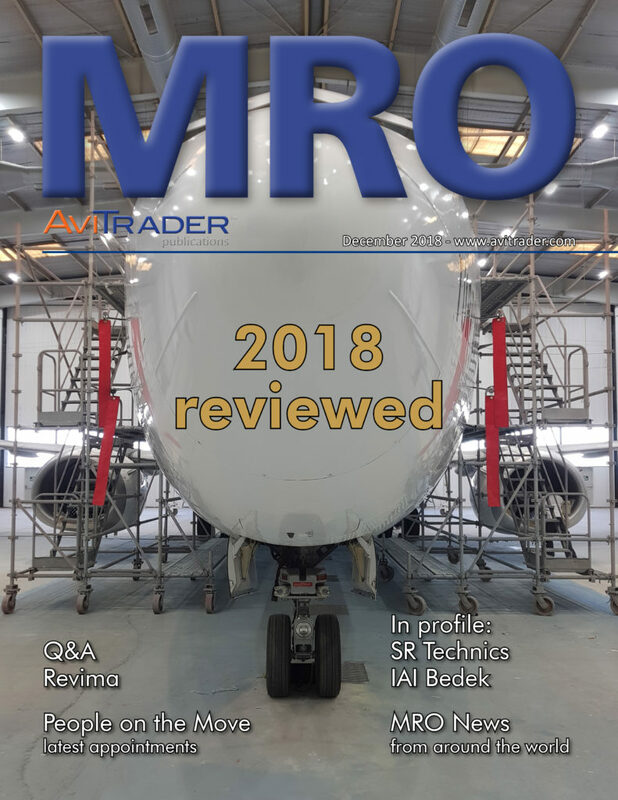 The Airlines, which are also users of MRO software AMOS, are set to be the first organisations to benefit from significant operational efficiencies and cost savings from FLYdocs®’ holistic approach to data management, as the platform has an exclusive integration with AMOS, and its advanced functionality is enriched further by live feeds from the ATA e-business specifications, Spec 2500. AerCap Holdings N.V. has delivered one new Boeing 787-9 Dreamliner on long-term lease to EL AL. This is the first of four new 787-9 aircraft to deliver to EL AL from AerCap’s order book with Boeing. The remaining three aircraft will deliver through 2019. Aengus Kelly, CEO of AerCap said, “The delivery of our first 787 to EL AL heralds the next chapter in the long history of successful cooperation between our two companies. We are very pleased to support EL AL’s ongoing fleet modernization program and we thank them for the confidence they have placed in AerCap." Lufthansa Technik and Japan Airlines (JAL) have expanded their trusted partnership by entering into a long-term agreement on Total Component Support (TCS®) services for the carrier's Airbus A350 fleet. For a period of ten years the new contract covers the majority of Japan Airlines' Airbus A350 components. The contracted services include maintenance, programs for reliability monitoring and enhancement as well as logistic services. Currently JAL holds 31 firm orders and 25 options for the state-of-the-art long-range jet. With the new agreement, Japan Airlines and Lufthansa Technik continue to expand their successful relationship which already includes a variety of MRO services. Among others, Lufthansa Technik has been providing TCS® services for Japan Airlines' Boeing 787 fleet since 2011. Aerospace solutions company Southeast Aerospace , has been awarded the opportunity to provide project management and engineering support services for the U.S. Navy through a new contract vehicle, SeaPort-NxG. Modifications, "we're honored to have been selected to support the Navy over the next 10 years. Our in-house capabilities offer a unique subset of services to provide cost effective solutions while maximizing efficiencies." The SeaPort NxG contract is an Indefinite-Delivery, Indefinite Quantity Multiple Award Contract with a value of US$50 billion for individual task orders across 23 functional areas. SkyWorks Holdings has announced transactions and activities performed during the fourth quarter (Q4) 2018 for its Leasing & Asset Management Group. 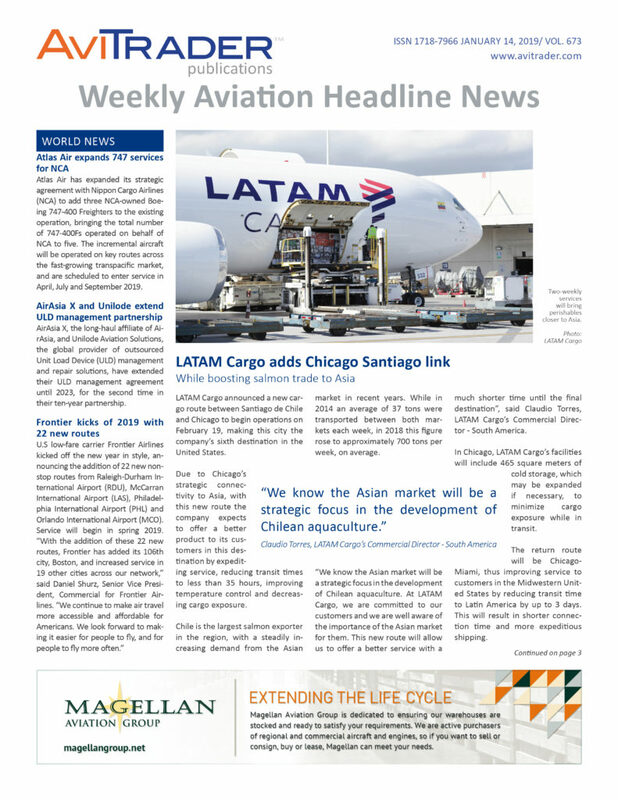 On behalf of Modern Logistics, Brazil, SkyWorks sourced and arranged an operating lease for one additional 737-300SF aircraft (its 4th 737SF). SkyWorks also renewed its engagement with Modern Logistics to provide continued aircraft sourcing and fleet analytical support services. On behalf of a US investor, SkyWorks arranged a long-term lease extension with American Airlines for one A319-100. On behalf of its Sierra Echo Aircraft Leasing Limited vehicle, SkyWorks closed on the acquisition of 8 Boeing and Airbus aircraft from 4 different sellers. The aircraft are on lease to 5 different operators globally and will be managed by SkyWorks Leasing (Ireland) Limited. SkyWorks was retained by Aviator Capital to arrange the sale of a portfolio consisting of five commercial jet aircraft and two engines on lease to various operators. The RFP has been launched and closing is scheduled for Q2 2019. SkyWorks was retained by a US investor to perform lease return and aircraft remarketing services for one 737-700, available Q3 2019, and one 777-300ER, available Q1 2021. Delta Air Lines has reported financial results for the December quarter and full year 2018. Adjusted pre-tax income for the December quarter 2018 was US$1.2 billion driven by over US$700 million of revenue growth, allowing the company to fully recapture the US$508 million increase in adjusted fuel expense and produce an 11% adjusted pre-tax margin. Adjusted earnings per share increased by 42% year over year to US$1.30. For the full year, adjusted pre-tax income was US$5.1 billion, a US$137 million decrease relative to 2017 as the company overcame approximately 90% of the US$2 billion increase in fuel expense. Full year adjusted earnings per share were US$5.65, up 19% compared to the prior year as the company recognized benefits from tax reform and a four percent lower share count. Delta’s adjusted operating revenue of US$10.7 billion for the December quarter improved 7.5%, or US$747 million versus the prior year. Total unit revenues excluding refinery sales (TRASM, adjusted) increased 3.2% during the period driven by healthy leisure and corporate demand offsetting an approximately 0.5 point headwind from unfavorable foreign exchange rates. For the full year, adjusted operating revenue grew to nearly US$44 billion, up 8% versus prior year on an increasingly diverse revenue base, with 52% of revenues from premium products and non-ticket sources. Premium product ticket revenues increased 14% along with double-digit percentage increases from cargo, loyalty, and Maintenance, Repair and Overhaul revenue. Chainey is a legal leader and corporate generalist with over 15-years experience advising senior executives of Fortune 500 companies, venture businesses and government entities. As chief legal officer and a member of the executive team, Chainey will advise Panasonic Avionics’ leadership on the company’s strategic direction. Her responsibilities will include overseeing legal issues, promoting a disciplined compliance culture and analyzing legislation and its effect on the company. She will also manage commercial contracts and lead complex projects and transactions. North America (PNA) with a dotted line reporting structure to Panasonic Avionics’ Chief Executive Officer, Hideo Nakano.